Start and finish strong. The lightweight design of these work boots helps maintain all-day comfort. Composite toe and heel reinforcements add impact resistance. A waterproof-breathable design works with the sweat-wicking liner to keep your feet dry in all conditions. Resilient cushioning and enhanced arch support help you finish the day in comfort. Best work boot I've ever bought!!! 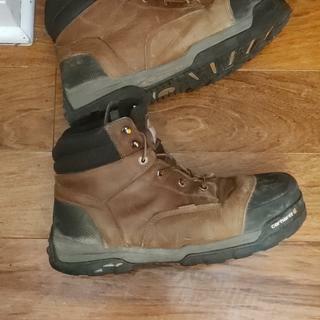 As a construction worker I wore these boots for two years straight! The insole is AMAZING! I can't tell you all the brands I've tried but they all were Terrible as far as comfort goes. I could work 12 hours straight, hard labor, and never have the fatigue feeling in my feet. The composite toe is barely even noticeable in the the shoe when you wear it. The hard shell on the front is durable, no matter how much I drag it there still solid! I started a new job that requires a safety toe boot. They were paying. I went to the store and tried on 12-15 pair of boots from Timberland Pro, Georgia Boot, Wolverine, Carhartt, and Skechers. Some of them I tried on multiple times and in several sizes. These were the most comfortable by a country mile. The rubber toe cap looks goofy, but I suppose it will wear well. They did rub some soft skin off the inside of my heels, but I will chalk that up to wearing sneakers for years and years. I have been wearing them for three weeks and they feel great. I would have passed over these, as a clothing manufacturer making boots, but now I am considering their other goods as well. Size 11M, 3 weeks wear in shop environment. Great Quality Boots, I love them. Carhartt has always been a brand that I have trusted. Comfortable and durable. Although, I do feel like the traction of the boot can be increased for slippery weather ( Black ice, etc). Besides that its my everyday boot for work and winter use. Awesome boots. Just got my second pair. Work in the mining industry, lots of chemicals, mud, expanded metal, climbing etc.. Definitely recommend waterproof, cushioned long lasting. First pair still going strong after a year. Honestly the best boot I have worn!! I have tried MANY different boots through the years and these top them all. I am on my feet all day and these stand the test! You have to try these if you are looking for comfortable and affordable boots! Ordered these boots in my usual size (9W) but found they were too wide. There's lots of room in the toe box (maybe a bit too much) and they were also quite loose in the heel. Didn't matter if I was wearing medium or heavyweight socks - the boots were just too big. I've returned them and will re-order in 9M. I wouldn't agree that these are "lightweight" boots but they appear to be very well constructed and I'd hazard a guess they will outlast most boots of this style. I look forward to getting the 9M's and hope they will fit better. Will submit another review after the 9M's arrive. Extremely comfortable, highly recommend. Would've gotten 5 stars but it holds smell a lot worse than other work boots I've had in the past. I bought these because I had bought a pair of Carhartt boots 10 years ago that I still wear. Living in Texas - there are not any distributors that carry boots. So I took a chance and ordered the same size. When I put them on - 1st felt they were very comfortable. Most comfortable bought I have ever purchased. I have bought other brands. These are by far the most comfortable boot I have purchased. I’ve tried many different boots from all sorts of brands, but if you work in a retail (I’m a merchandiser for Coca-Cola), then I think these are the absolute best boots you can wear. These are the only boots I’ve worn that don’t hurt my feet after walking (sometimes upwards of 7 miles) around supermarkets all day. They are comfortable, the soles provide good traction on dirty/dusty floors, and the composite toe is great to have just in case, accidents do happen. I do plan on buying these exact pair of boots if mine ever wear out. I have been wearing the boots daily on 12 hour shifts in a mining processing plant. Deal with a lot of chemicals, mud, climbing stairs, etc... They wear great and have held up very well. Have been in service since Feb. Despite originally developing a blister on my heel (I think more due to my not being used to laces on my work boots and not tying then tight enough). I really like them. They look great, are comfortable, and seem like overall good pair of shoes. I would absolutely recommend these boots. They take a bit of breaking in, but so far I think it'll be worth it. Right out of the box this boot fit like a glove. Very happy with the purchase and the price. Outstanding from the start - no break in needed! We've all come to expect quality and utility from Carhartt, With these boots I expected the same expeince I've had with just about all new footwear. These boots were so comfortable when I tried then on - I left them on and did a 2 mile walk with the dog in the woods. If they weren't a bit dirty on the bottom I could have left them on more at home. Great job. I have been wearing Carhartt for 15 years. The first model was discontinued, it was a great boot. The next model was also a great boot and I am still wearing them. I decided to try this new model, what a mistake. I have been trying for a month to get this boot broke in but I still causes blisters on the back of my ankle. I cannot go a full day wearing them. When I put them on it feels like putting on a cardboard box. Very much not liked. I purchased this or my company paid for my work boots. 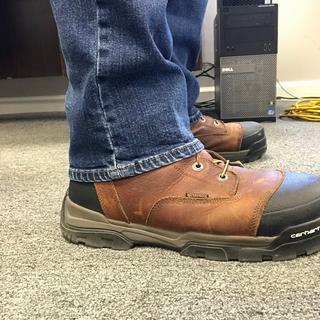 I finally have found a comfortable work boots on my labor/mechanical industry...my work consist of being on my feet all day in all types of elements...Rainnor shine. I've had these for a month now and broke them in. Once broken in they conform to your feet for a superior fit. I've gone through so many boots all big high dollar named brands... and Carhartt pulled through for me...I'm really enjoying them! Now near quitting time my feet don't ache...I'm good to go another 4 hours! I will continue to buy this specific steel toe work boot from Carhart!!! Boots fit nice, they did take a while to break in. my ankle rubs against the leather. This quite possibly might be to most comfortable boot I ever put my foot in. The sign showed four layers of cushion technology in the making of the boot and I could feel all the work was not in vain. With the composite toe it will be my go-to boot whenever I do any projects. Are these waterproof? If not which styles are? BEST ANSWER: Yes, this style is waterproof. What is difference between this and cma6335? BEST ANSWER: The CME6355 will have Insite® technology footbed engineered with maximum arch support to reduce foot fatigue. Does this show have a steal shank? BEST ANSWER: This style will have a nylon shank. Difference between these and the STYLE #CMF6380? BEST ANSWER: This style features a Carhartt® footbed made with Insite® Technology, which is engineered with maximum arch support to reduce foot fatigue. BEST ANSWER: Yes, this style offers the best slip resistance. What is the astm rating on this boot? BEST ANSWER: This boot meets ASTM 2413-11 EH.